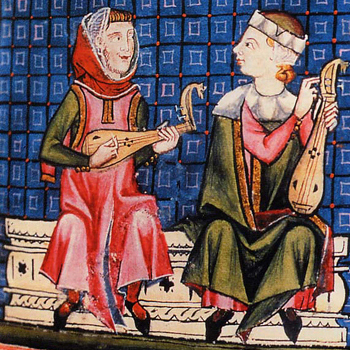 This is an early form of the gittern, closely based on an illustration in the 13th century "Cantigas de Santa Maria", a huge collection of poems, written in Galician-Portuguese and set to music during the reign of Alfonso X 'El Sabio' (1221-1284), King of Galicia, Castile and León. Unlike the surviving 15th century gittern by Hans Oth, this gittern is single-strung (one string per course). The illustration shows three strings, but I have designed it with four, which makes it a little more versatile. The shape of the gittern is derived as accurately as possible from this image. Likewise the string length, which comes out at 40cm. but I can calculate string gauges for your preferred tuning. I don't claim to be a master carver, but I can usually produce a respectable carving of a simple animal's head. 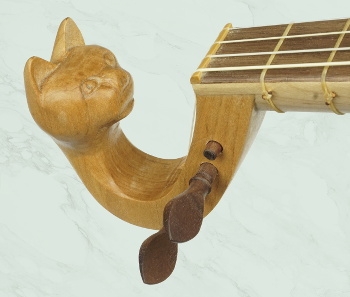 I'm willing to attempt more complex carvings, but the price reflects the long hours of sketching, re-sketching, chisel wielding and obsessive sharpening. Pick your favourite beastie and contact me. Carved head (replaces scroll) From £150, depending on complexity.